For 18 glorious minutes I dared to believe. Then on 74 minutes Alex Oxlade-Chamberlain broke the spell and in the end I was happy Spurs held on for a draw. You can have all the fourth places, and three points you like, it will never match up to the visceral adrenaline rush of taking the lead against our fiercest rivals. Before the match, Pochettino had surprised everyone by putting Ryan Mason in the starting eleven. To give a league debut to a 23 year old, in the centre of midfield, in a North London derby, is brave in the extreme and emphasises the new manager’s commitment to youth. Mason repaid him with a good performance and made himself even more popular with Spurs fans by kicking the irritating Jack Wilshere (currently top of my list of most annoying footballers). The game was the usual bad tempered affair, with nine bookings, six of which went to Tottenham players. Arsenal dominated possession but early on it was Spurs who looked more dangerous on the break. Pochettino had his team sit back, a sensible precaution after the 3-0 loss to Liverpool demonstrated the danger of pressing too aggressively against a side with the class to pass around the press. Several times Tottenham had great opportunities when counter attacking but a loose pass or a poor run meant they were wasted. Chadli and Lamela were two of the guilty parties. The breakthrough came early in the second half and in classic Pochettino style. Some energetic pressing from Kaboul forced a bad pass from Mertesacker to Flamini deep in Arsenal’s half. 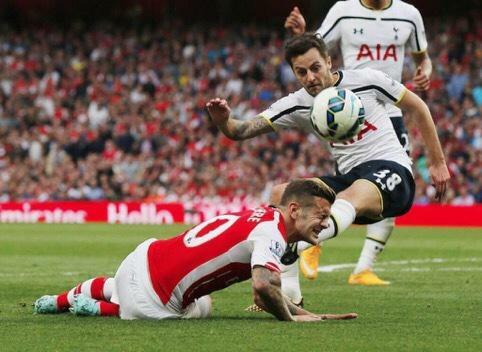 Eriksen pounced on the Arsenal midfielder and Lamela was quick to pick up the loose ball. Tottenham players made runs either side of the Argentine, who slid a perfectly waited pass to Chadli who finished clinically across a helpless Szczęsny. It was a moment of high emotion, especially after last season’s three derby losses without a goal. With the lead Spurs sat back even more, as Arsenal were forced to throw everything at us. The tension was unbearable as Lloris made several fantastic saves, including an especially good stop from a Mertesacker header that had the referee checking the goal line technology. The French goalkeeper was the man of the match, as so often last season. For once though, he could count on some help from his defence as, despite the pressure, the home team were finding it hard to create any real chances. Vertonghen fully justified his recall, while Kaboul had by far his best game of the season. The inevitable equaliser came in fortuitous style for the former Woolwich based team – a miss-hit shot from Welbeck teeing up Oxlade Chamberlain yards from goal. It was a cruel blow but at least Spurs still managed to hold on for a fully deserved point. This was a fantastic result for Pochettino, after his team had faltered of late. A draw against Tottenham’s arch rivals will give him and his players a much needed boost. His decision to throw in Mason was fully vindicated, his defence looked well organised, and most pleasing of all, he proved himself capable of adapting his tactics to win a hard earned point. Was Pochettino right to throw Mason in at the deep end? Are you happy with Spurs performance? Let me know in the comments below. This entry was posted in Match Reports and tagged arsenal, north london derby, Premier League, Ryan Mason, Spurs, Tottenham Hotspur, Woolwich on September 29, 2014 by Jon @ AnythingButPenalties. Spot on. Highly emotional indeed and the tension and adrenaline gave me a long overdue reminder of the excitement one can feel through watching football. Finally there was some leadership and determination from the lads. I think sticking Mason in was a masterstroke and it’s all useful experience for Poch as he figures out the ideal player combinations for the different kind of situations we’ll face throughout the season – early days yet but cause to be optimistic. Mason did do well. I really hope he can push on from here and avoid his injury problems. The derby definitely woke some players up.